Editor’s Note: In 2016, YCW partnered with the Lau China Institute at King’s College London to launch an inaugural essay competition on the topic: “How will China change the world?” We received dozens of impressive submissions from young voices all around the world, and published the winning essay by Lauren Dickey on China’s water security in January this year. Our judging panel selected two runners-up, including Matthew Phan’s submission, “Building bridges with bad debt,” a comprehensive analysis of China’s economic growth and its impact on thinking about trajectories of development. I am a credit analyst, so let me start with a data point from the bond markets. 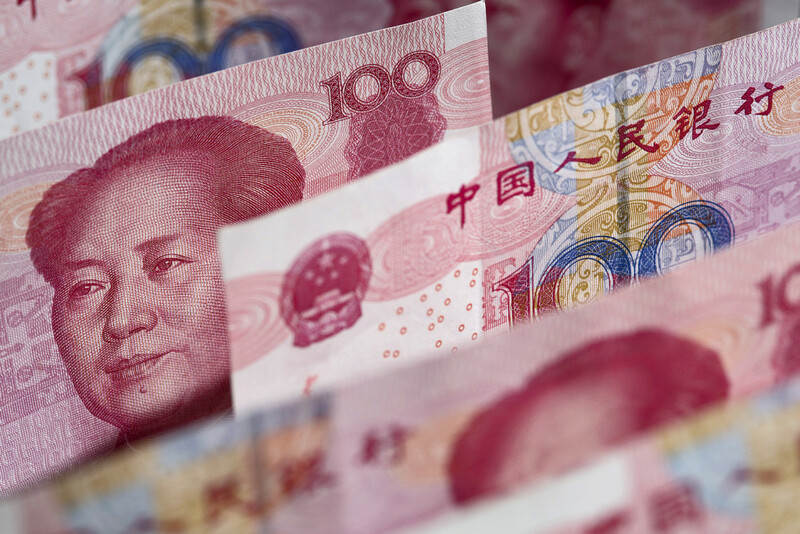 During some points in 2016, the preference shares of Chinese banks—that is to say, the riskiest type of bonds they can issue in international markets—offered investors half or less of the interest yield that European bank bonds paid. 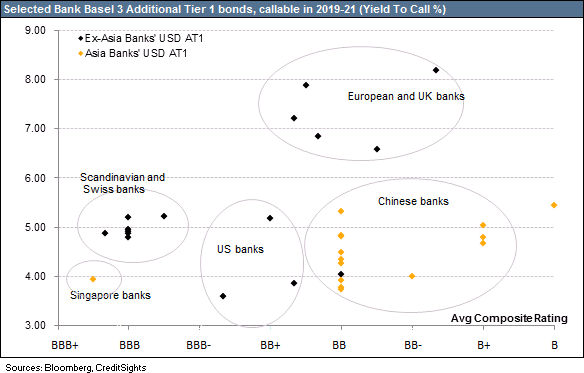 Europe has serious challenges, but the yield difference was surprising given the depth of problems that China faces. The economy is likely to continue slowing for a good number of years. Corporate debt relative to the size of the economy is higher than most other countries in the world. The IMF estimates that 15 percent of debt is owed by corporates where the incoming cash is insufficient to pay the interest—et alone the principal—on debt. This implies that a good part of the Chinese banking sector is possibly insolvent, or at least requires more capital. In fact, the preference shares of Chinese banks yielded less than not only European banks, but also the top American banks, including JP Morgan, Wells Fargo, Goldman Sachs and others. So, Chinese bank bonds are the most expensive in the world, even though Chinese banks are far from the cleanest and Chinese bank shares among the cheapest. Why this difference? It is less surprising once we accept how China’s financial markets work. Unlike in the U.S. and Europe, where there is little political will to grant another taxpayer-funded bailout, Chinese banks continue to enjoy strong government support. And as the country’s economic problems deepen, the government looks ever more committed to protecting the largest banks, which still help execute economic policy. Further, when a Chinese company wants to issue bonds, it rounds up what the industry calls ‘friends and family’. This includes other Chinese banks, insurance companies, perhaps an asset manager or two. These business associates buy and hold a large chunk of the issue. Part will also be packaged into so-called wealth management products and sold to the man on the street. This means less supply for international investors to purchase, which forces bond prices up. We may quarrel over whether this is a fundamentally ‘correct’ way of doing things. Economists criticize China for its capitalism with Chinese characteristics, while investors criticize China for its distorted markets. But others play the game – they find out how many ‘friends and family’ bought an issue, and if enough did, the smart manager goes along. Of course, this is the way Asia has worked for many years. The difference is that Chinese issuance is now a significant part of the global bond market, and—perhaps more importantly—Chinese investors are an increasingly significant part of the global investor base. The scale of financial flows out of China has increased significantly, with the result that markets are more and more affected by the behaviour of Chinese, rather than Western, investors. Just as the entry of American banks to the UK—the so-called Big Bang of the City of London—changed British banking over the last half a century, the entry of Chinese institutions into international financial markets will change global finance in the next half. Money comes and money goes, but money usually brings ideas, and ideas stay. This is how China will most fundamentally change the world – China will reset behavioural norms in various fields. And because of China’s size, the world will have to accept how China works. By this I mean it will have to come to terms not just with China’s military or economic power, but rather a sense of its influence, its presence in global conversations, its silent hovering at the back of the room. China will not simply be a new signatory to pre-existing agreements but will introduce new values, new demands, new negotiation tactics, new ways of getting things done, new institutions, which counterparts will have to accept and learn to deal with. You can snort about how unethical or unsophisticated or mafia-like these new norms are, but at some point you sit down to learn the new rules of the game. At the niche end of the scale, China is changing norms in bond markets. One level up, Chinese firms are acquiring international ones, which will influence their cultures—such as with Citic, the largest Chinese investment bank, and CLSA, a brokerage in Hong Kong well-regarded for its independence. At the regional scale, another version of purchasing influence and security is taking place via the One-Belt-One-Road policy. Globally, RMB internationalization could eventually give China significant sway over global finance and politics: There is a reason why U.S. regulators can fine international banks billions of dollars for breaching sanctions on financial transfers vis-à-vis Iran—the USD is the lifeblood of global finance and banks need access to the USD clearing system. The fact of Chinese influence is particularly true for Asian countries. Singapore and the Philippines are long-standing allies of the U.S., but both have in effect warned the U.S. that any hint of weakness on its part means that they will pivot toward China. This is not necessarily because they like China, but because China’s immutable physical proximity will, by the laws of realpolitik, demand it. But it is also true, I think, for Europe, which isn’t all that far away from China, and particularly so for the UK, in its post-Brexit isolation. Along the way the world will also come to understand the constraints that China herself faces and which shape her policy choices. Let me use another economic example as I am more familiar with that field. Bad debt – what’s different this time? First, there is a large and unknown amount of bad debts on the bank balance sheets. The banking system is still grappling with the overhang of massive bad debts, both in the loan book and via exposures to shadow banks. Second, investment was often channelled through companies directly or indirectly owned by both the central as well as local-level governments. This means that though China’s debt problem is nominally one of excessive corporate debt, it is unclear how much of the corporate debt is actually formally or informally linked to the state. Third, the investment was largely channelled into areas such as steel or coal, which are now in serious overcapacity. However, many towns depend heavily on one sector or even one factory for jobs, which makes closing down the inefficient surplus factories a difficult task in political terms. China is tackling these problems that highlight the unique nature of the government’s capabilities but also its economic, political and social constraints. Unlike after the 1997 Asian crisis, when four state-owned asset management firms were set up to buy the banks’ bad debts wholesale and at full price, today China is adopting a multi-pronged approach. Credit losses are being shared. Corporate borrowers are having to downsize or merge, while bank and other creditors are increasingly taking losses. 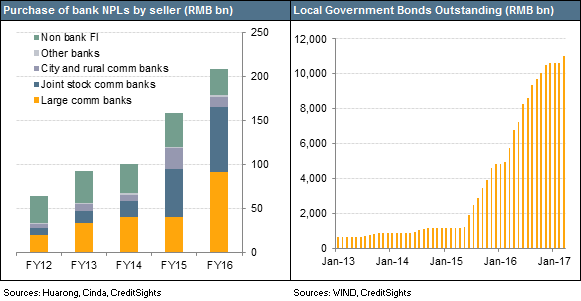 But China has also allowed some municipal government-related borrowers to issue new bonds, which are formally guaranteed by the central government, as a way to refinance old loans—so there is some element of a central government bail-out. This approach is an attempt to solve all three issues at the same time—that is, to deal with the bad loans, to increase transparency on who bears ultimate responsibility for paying down debt, and to support specific companies whose closure could threaten employment and social stability. Why is China taking this approach? The pat answer is that this is the Chinese way. A more nuanced but also rather commonplace answer is that China values stability. This is certainly true, but I would complement this with two other reasons—China’s large size, and its population density. The large size means there is a constant tension between what the central government wants and how these top-down strategic policies are implemented down at the local level. My hypothesis is that in the financial space, the government wants to preserve the solvency of the large state-owned banks as a way to preserve its policy options in the event that it needs to use them to transmit monetary policy in a direct manner. This is why we have the paradox of state-owned commercial banks. The banks make day-to-day lending decisions on a commercial basis, but are latent tools that the government can call on if needed. And the government is in fact using them. The central bank is lending large amounts of money to the banking system, which is using part of the funds to acquire municipal bonds. Some have called this ‘shadow’ quantitative easing, as it is an indirect way of achieving what Western central banks have done, which is for the central bank to purchase government bonds directly. Given the treacherous transition ahead, it is not difficult to understand why the government wants to retain as much policy optionality as it can. The population density means China has a vast number of small time entrepreneurs which demand a large amount of credit. The banking system set up from the 1980s onwards has proved incapable of meeting these needs. Thus, the key underlying issue that China’s financial system faces is not—as per America—that credit is priced too cheaply for households, but rather that credit is priced too cheaply for state-owned or other large companies but is available only at very high costs to small private enterprises. Shadow banks such as trust companies or Internet-based peer-to-peer lenders thus emerged to lend to these once-neglected customers. This is why the government has not banned shadow banking outright but instead aims merely to formalize and monitor it. At the same time, the large and still relatively poor population means the government needs to generate employment for hundreds of millions, thus necessitating that state-owned industrial firms be kept alive via loans from the banking system. Whether or not it will ultimate be successful is still an open question, but it is arguably a more coordinated though less market-oriented and less transparent approach to resolving financial crises, than the West adopted in 2007. As world comes to understand, rather than fear, China, it could start to adopt and adapt Chinese solutions. Western economies have not themselves fully digested the industrial hollowing out of the 1980s; the rise of extremist parties in the U.S., UK and Europe is partly a delayed result of this process, which created a disgruntled lower class. China is now forced to grapple with these issues—could it emerge as a global leader, or at least participant, in thinking about how to address questions like structural unemployment from de-industrialization, or an aging workforce—as it might start to on climate change? To date, the West has absorbed from China mainly manufactured goods and migrants, but few truly influential ideas. Conversely, China has absorbed from the West vast amounts of capital, but also ideas about how societies, institutions and businesses should work. The capital is starting to flow the other way; could ideas follow? 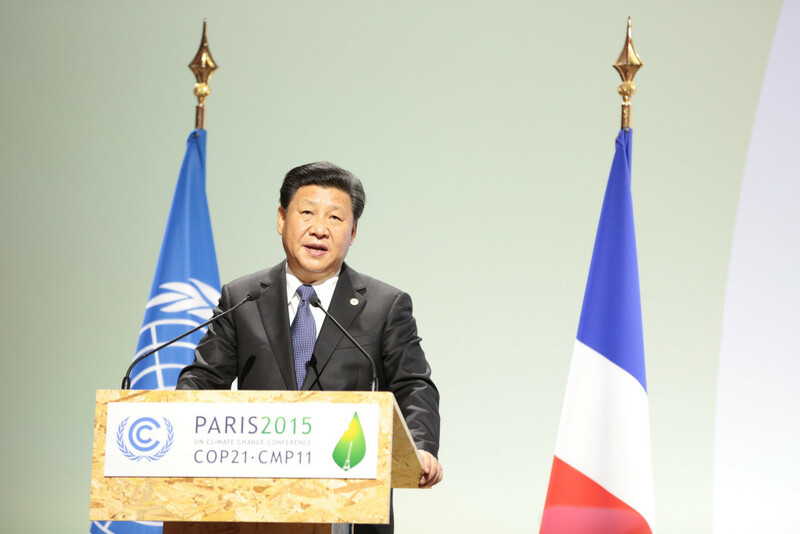 President Xi Jinping speaks at the COP21 UN Climate Change Conference in Paris in 2015. Credit: Flickr / UNclimatechange. One of the hardest challenges with writing about China is setting the right perspective, and one of the hardest parts within this challenge is bridging the perception gap. By this, I refer to the unfortunate tendency for Westerners to be incredibly sceptical that anything good can come out of China, and conversely for Chinese to be incredibly sceptical that Westerners can have anything but insecure and hostile attitudes to China. (Tourism and food aside, start a discussion of any serious political, social or economic issues, and the inherent differences surface rapidly. The gap is especially obvious in financial markets, where unlike at a dinner table, it is very easy to express approval or disapproval in a politically neutral manner, by deciding whether to buy or sell; at least, if you are not a sovereign wealth fund.) Fortunately, the gap usually disappears, or at least narrows, the longer the time or deeper the opportunities that Westerners and Chinese have to interact. It does not mean that a Westerner necessarily grows to like China, but he or she will come to understand and perhaps even empathize with China. China’s rise will force people from other parts of the world to cross the perception gap. This might sound anti-climactic, but in my view, if it happens to enough people, it will be the deep micro-level change underneath what on the macro stage will look like a shift in the geopolitical balance of power. It will also be, for many, at the personal level, the most satisfying aspect of China’s rise: the opportunity to get to know another culture. Finally, this opening of minds will be—unlike Chinese bank capital, which may well default one day—a long-lasting asset. Matthew Phan is a senior analyst at CreditSights, an independent research firm, where he writes on the Chinese banking system and on Asian credit strategy. He graduated from Columbia University in New York in 2005 with a B.A. in Economics and Mathematics, and is a CFA charterholder.